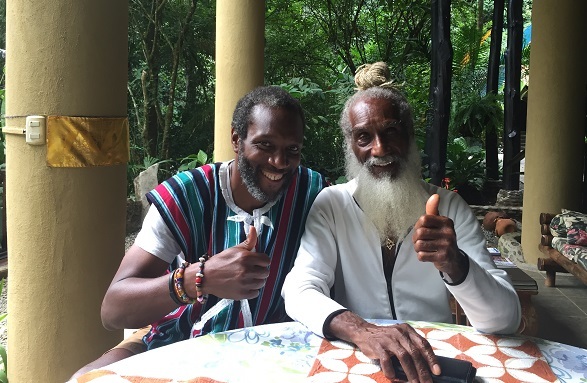 Aris Latham, the Father of Gourmet Ethical Raw Foods Cuisine, Returns to Jamaica which is ranked 16 of the world’s sought-after vacation spots. It is a place that people come for wellness, healing, and rejuvenation. The descriptive of sun, sand, and sea are no longer enough to describe our destination. Travelers are seeking to engage with their host countries to learn about how people live and share their culture. Boomers are living longer and along with Millennial are leading the wellness revolution. They are seeking destinations with vibrant spa offerings, healthy foods and wellness programmes to transform their lives. In walks, Dr. Aris Latham and he pushes the proverbial envelope wide open. From his vantage point being well will never be looked at as a challenge but as Fun. Latham is not going to accept mediocrity when the central life force on the planet is readily available, the SUN. Latham returns Jamaica the land of his ancestors to fulfill a wellness consultancy at Half Moon Spa. He is infusing ethical Raw Food, into their menu. While on the island he is available for Sunfired Foods training, certification and speaking engagements. Together, Selby and Latham unveiled a delicious and impressive menu, which consisted of tantalizing Appetizers, Root Shots of ginger, turmeric and beet followed by Tamarind, Sorrel & Jaboticaba coolers, Garden House (Russell’s brand) Kale chips and Quinoa & Flax Seed crackers served with Hummus. The Main Course included: le “pièce de résistance,” the Jamaican Bigga, served with Ackee cheese. Participants at the event had an up-close demonstration of its preparation. It was a huge favorite. 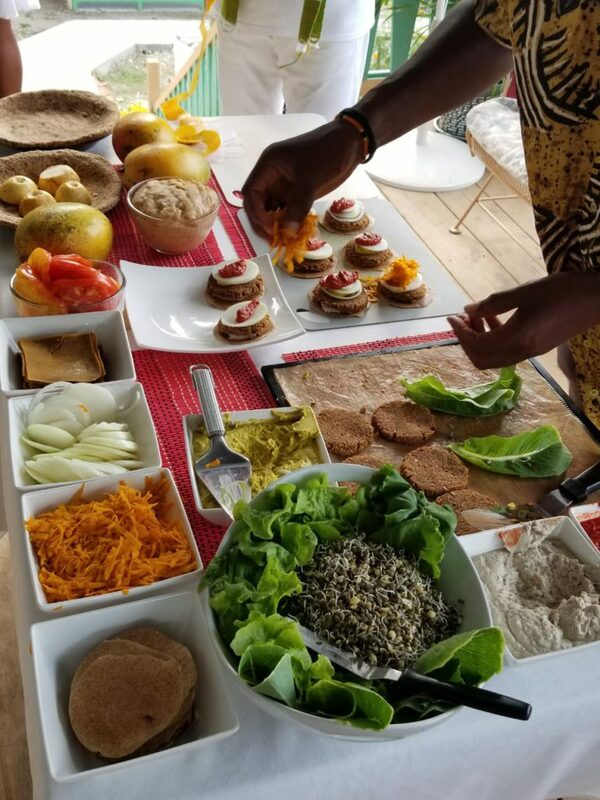 The burger was made out of nuts and seeds and stacked with ackee cheese, and vegetables. Can you guess what was for dessert? Hint – what is Dr. Latham’s trademark? And what is Mutabaruka’s favorite Sunfire entrée? Well if you give up, I will tell you, Paradise Pie with an all-natural pie crust made with raisins and nuts and filled with fresh mangoes and a guava jam that glues it together. The entrée served with Lemon Grass or, lack Mint tea was a hit with participants. Contemporary raw food diets were first developed in Switzerland by Maximilian Bircher-Benner (1867 – 1939), who was influenced as a young man by the German Lebensreformmovement, which saw civilization as corrupt and sought to go “back to nature”; it embraced holistic medicine, nudism, free love, exercise, and other outdoor activity, and foods that it judged were more “natural”. Bircher-Benner eventually adopted a vegetarian diet, but took that further and decided that raw food was what humans were meant to eat; he was influenced by Charles Darwin‘s ideas that humans were just another kind of animal and Bircher-Benner noted that other animals do not cook their food. In 1904 he opened a sanatorium in the mountains outside of Zurich called “Lebendinge Kraft” or “Vital Force,” a technical term in the Lebensreform movement that referred especially to sunlight; he and others believed that this energy was more “concentrated” in plants than in meat, and was diminished by cooking. Patients in the clinic were fed raw foods, including muesli, which was created there. These ideas were influential to Ann Wigmore a notable raw food advocate but were dismissed by scientists and the medical profession as quackery. One of the earliest books to advocate raw foodism was Eugene Christian’s Uncooked Foods and How to Use Them, 1904. Other proponents from the early part of the twentieth century include Californian fruit grower Otto Carque (author of The Foundation of All Reform, 1904), George Julius Drews (author of Unfired Food and Trophotherapy, 1912), Bernarr Macfadden and Herbert Shelton. Drews influenced John and Vera Richter to open America’s first raw food restaurant “The Eutropheon” in 1917. Shelton was arrested, jailed, and fined numerous times for practicing medicine without a license during his career as an advocate of ‘rawism’ and other alternative health and diet philosophies. Shelton’s legacy, as popularized by books like Fit for Life by Harvey and Marilyn Diamond, has been deemed “pseudo-nutrition” by the National Council Against Health Fraud. In the 1970s, Norman W. Walker (inventor of the Norwalk Juicing Press) popularized raw food dieting. Leslie Kenton‘s book Raw Energy – Eat Your Way to Radiant Health, published in 1984, added popularity to foods such as sprouts, seeds, and fresh vegetable juices. The book advocates a diet of 75% raw food, which it claims will prevent degenerative diseases, slow the effects of aging, provide enhanced energy, and boost emotional balance; it cites examples such as the sprouted-seed-enriched diets of the long-lived Hunza people, and Gerson therapy, an unhealthy, dangerous and potentially very harmful raw juice-based diet and detoxification regime claimed to treat cancer.